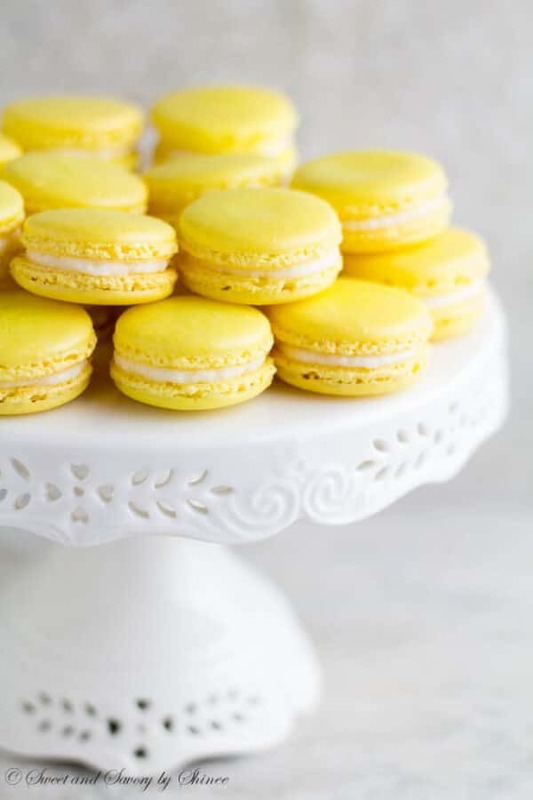 My easy to follow step-by-step directions will guide you to these pretty lemon macarons with zesty lemon buttercream. A short video is included! Sometimes I feel fortunate that we don’t have any bakeries close by that sells French macarons. I probably would be spending way too much to satisfy my cravings. Instead, when the craving hits, I bring out my mixer and get to whipping the egg whites. Did you know that you can make these delightful confections yourself way cheaper than $2/each? Yeah, sounds pretty exciting, but you might have been putting it off because it’s too difficult, or intimidating. Well, fear no more! I’ve made a short video tutorial to show you how I fold my French macaron batter to make perfect little macarons! In this video, I wanted to show you how the batter consistency changes with each fold. Therefore, I opted not to cut anything out, but instead I simply sped up the folding process in some places. The whole folding process took about 3 minutes. UPDATE: I also made this full video tutorial to show you the entire process of making macarons. Hope you find it helpful. I hope after watching the video you’ll start whipping those egg whites and sifting the almond flour! I’m personally not a huge fan of basic buttercream. But I’m totally head over heels about this lemon buttercream. It’s so light and zesty, sour, yet sweet. 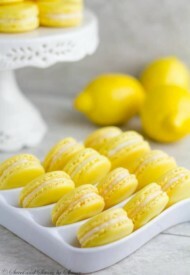 Absolutely awesome filling for my lemon french macarons. Oh by the way, french macarons taste way better on 2nd or 3rd days. The flavors from the filling really soak into the shells and the whole thing becomes just absolutely heavenly! And the bonus, it won’t break the bank! It’s always cheaper and better when it’s homemade! In a large mixing bowl with whisk attachment, beat the egg whites on medium speed until foamy. Add cream of tartar and continue to beat. Slowly add sugar one tablespoon at a time. Increase the speed to medium high and beat until hard peaks. Add lemon zest, vanilla extract, lemon juice and yellow food coloring. Beat on medium speed for one more minute. Sift the almond flour/powdered sugar mixture over the whipped egg whites. Gently fold the mixture running the spatula clockwise from the bottom, up around the sides and cut the batter in half, as shown in the video above. The batter will look very thick at first, but it will get thinner as you fold. Be careful not to over mix it though. Every so often test the batter to see if it reached the right consistency. To test the batter, drop a small amount of the batter and count to ten. If the edges of the ribbon are dissolved within ten seconds, then the batter is ready. I repeat, do NOT mix again. If you still see edges, fold the batter couple more times and test again. I posted a few pictures above to show you how just couple of folding changes the consistency of the batter. This step is so crucial, so please make sure to test often to ensure not to over mix the batter. Pipe out 1.5-inch rounds about an inch apart on two baking sheets lined with parchment paper. 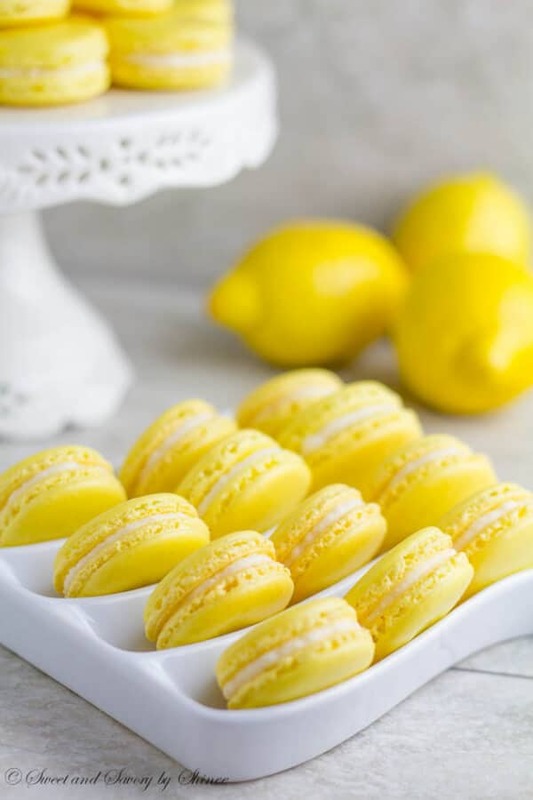 While macarons are drying, prepare the lemon buttercream. In a mixing bowl with whisk attachment, beat the butter until fluffy. Add powdered sugar, heavy cream, lemon juice, lemon zest and salt and beat until well combined. Transfer the buttercream into a pastry bag and fill the macarons. It’s best to serve macarons the next day.